The 2012q4 QCEW data was just released the other day by the Employment Department and as regular readers know, this data is very useful in terms of gauging future employment revisions. As has been the case in the past couple years, the statewide data will be revised upward in the future; the QCEW data indicate employment gains above and beyond what is currently published in the monthly CES data for the end of 2012. None of this is particularly surprising given the recent history of revisions, however what is somewhat surprising is where the revisions will be geographically in the state. As discussed previously, the Portland MSA has been the source of growth in the state in recent years while regions outside of Portland have seen no net employment gains. Additionally, the vast majority of the upward revisions to Oregon data have also been in the Portland MSA. This is beginning to change and regions outside of Portland are now showing encouraging signs. It might have taken 4 to 5 years since employment began to decline in some regions, however job growth has returned to some of the state’s hardest hit areas. Both Bend and Medford have added jobs over the year and the latest QCEW data indicate that these employment gains have actually been substantially larger than the currently published CES numbers show. 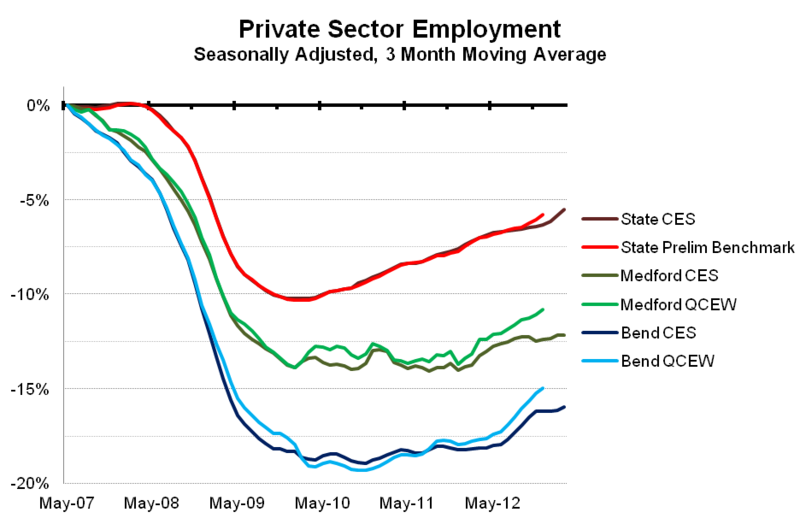 The published monthly employment data indicate private sector job losses due to the housing collapse and recession of about 19% in Bend and 14% in Medford; the same data show job gains from the bottom of about 3% and 2.8%, respectively. This latest QCEW data show that these gains are really closer to about 5.5% in Bend and 4.8% in Medford. This amounts to about 1,300 more jobs in each city . Even though there remains a long way to go before these local economies become healthy or approach what they once were in terms of job counts, these certainly are encouraging signs. Part of the improvement does have to do with an improving housing market. New home construction is currently growing quite quickly, albeit from extraordinarily low levels. A lot of recent new construction both locally and nationally has been in the multi-family market, however most of Oregon’s multi-family activity is either in Portland – the largest metro – or the college towns – Corvallis and Eugene. The single family home market is coming back as well, although not quite as strong as multi-family, or at least not yet. 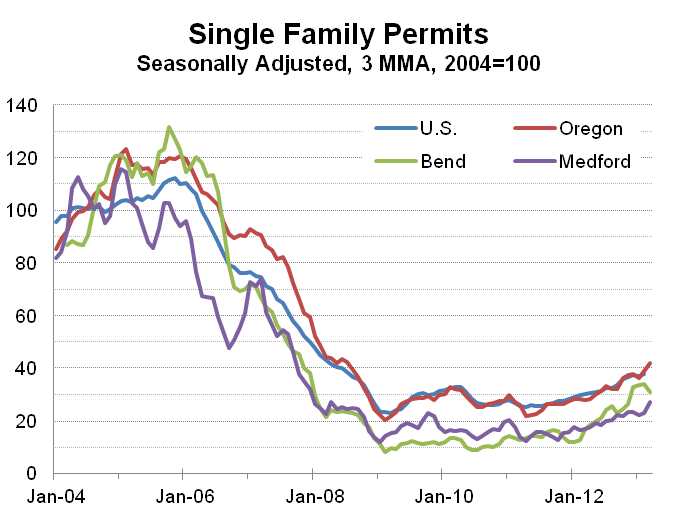 In terms of the number of newly issued permits for single family homes, growth is about 26% nationally in the past year, while Oregon has seen a 39% increase, Medford has seen a 41% increase and permits in Bend have more than doubled. While a housing rebound is good for homeowners – helping to support household balance sheets and consumer spending – and construction workers, the employment gains seen in both Bend and Medford are spread across nearly all industries. The graphs below show job gains by industry in each city over the past year, using the fourth quarter QCEW data. 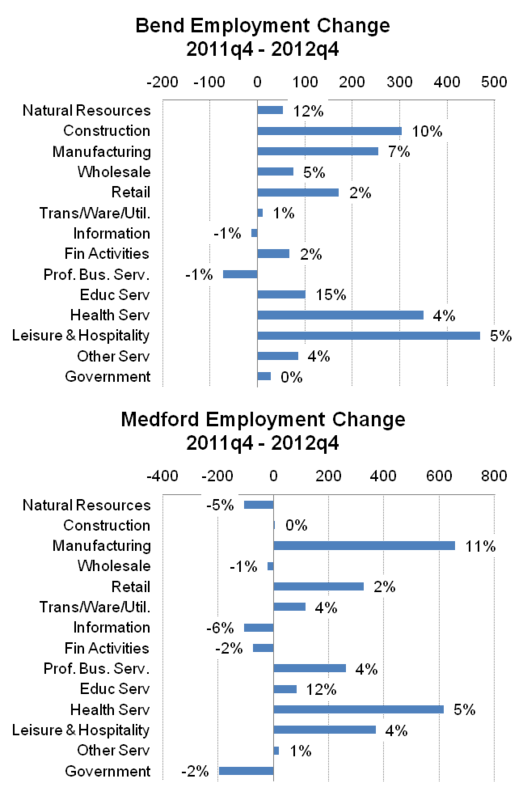 The length of the bar shows the change in the number of jobs in each industry while the percentages indicate how strong the growth is. While no region in the state is all the way back to pre-recession employment levels, more regions are now adding jobs. It may not be much yet in terms of the number of jobs (the state is just a little bit under halfway back), but it is an improvement and moving in the right direction in terms of jobs and income is always better than the opposite. You can think of it as a necessary but not sufficient condition for a full recovery. As always, I very much enjoy these posts. The single family permit graph is of interest to me because my wife works for Polk County in the community development and building department. I suspect that most of the growth in Oregon has been driven by the Portland MSA. I know her office is struggling with low budgets due to insufficient permits. Last year was worse than the year before from what I have heard, although part of that is due to ARRA funds that build a national guard readiness center. The other signs of life look promising, we can only hope that other factors don’t derail any progress. Thanks for the feedback Ian; always appreciated. Yes, the fact that the improvements are spreading beyond Portland is very encouraging and hopefully won’t be derailed before they really get going. Unfortunately we have yet to see this broader improvement in the Salem MSA. Home construction is up in Salem but employment has yet to fully turn the corner. We suspect a lot of that has to do with the relative budget positions of the public sector – they’re growing, yes, yet below historical expansion rates – which is much larger here than other areas. Thanks Annette! Union County is not one of the counties I track on a regular basis but the Census Bureau does publish housing permits for the county, so I went and tracked those down. Like a lot of places, their level of permits (and likely actual activity) has turned around a bit, yet has quite a ways to go. In Union County the actual number of permits is flat over the past couple years but the number of units for those permits is up a bit. That means they are building more multi-family however, like less populated areas, multi-family is pretty rare and single family homes account for the vast majority of the industry. The other college areas of the state, well Corvallis and Eugene, have seen a big uptick in multi-family, whereas it does not appear to be the case at EOU, or not to the same degree.